Welcome to Cheemaun Beach Villa, our luxury 3 bedroom rental villa, located at Oil Nut Bay Resort. Cheemaun Beach Villa offers guests the best location with the most amazing ocean views. 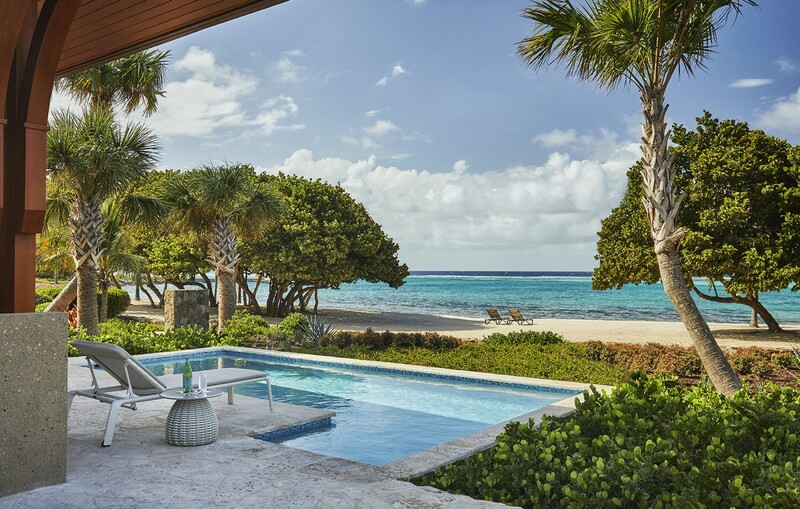 From the villa, you are right on the powdery white sandy beach and the turquoise ocean is just a few steps away. Stunning high ceilings feature in the Great Room, with luxury furniture and beautiful interior finishes throughout. The two master bedrooms face incredible views of the crystal blue waters. Each bedroom has its own ensuite bathroom with indoor and outdoor showers and also a private patio with loungers. The double queen guest bedroom has a private, separate entrance and ensuite bathroom with an indoor shower. The spacious outdoor terrace has a built-in grill and luxurious outdoor furniture for lounging and relaxing with friends. Cheemaun Beach Villa features a full gourmet kitchen with bay views. This is the perfect kitchen for the chef in your party who likes to create their favourite meals. Guests can choose to dine inside or outside, the choice is yours. Oil Nut Bay Resort has everything you could possibly want in a luxury vacation. Whether you are looking for complete relaxation or an activity filled vacation, then this is the luxury resort for you. Enjoy kayaking, sailing, paddle boarding and so much more. The crystal clear ocean at your doorstep is also perfect for snorkelling. During your stay, why not enjoy the amazing spa on offer at Oil Nut Bay Resort. Perched on the beautiful cliffs of Oil Nut Bay and designed to harmonize with nature, the spa invites guests on a journey of relaxation and rejuvenation. The peaceful ocean view retreat features two serene treatment rooms with floor-to-ceiling windows opening to the endless blue waters of the Caribbean Sea, in addition to a beauty room, terrace with heated saltwater plunge pool and yoga platform. The Spa features Organic Pharmacy luxury beauty products. Hand-made in small batches in London, they utilize the highest level of extracts and herbs to ensure superior quality and exquisite texture. Oil Nut Bay Resort offers delicious dining at the Beach Club Restaurant. Here you will enjoy world class food in a beautiful setting. Alternatively, you can enjoy a romantic beach dinner, specially organised for you. When you book with Exceptional Villas, you will also have your very own dedicated concierge, who will be on hand to help with every aspect of your stay. What ever you want during your stay, we will be here to take all the stress away, so all you have to think about is the crystal blue waters that awaits you. Cheemaun Beach Villa is close to the Beach Club, Arrival Dock and Resort Center, making it the perfect location to experience the luxury and pristine beauty of Virgin Gorda. Oil Nut Bay Resort is ready to offer you your dream vacation.